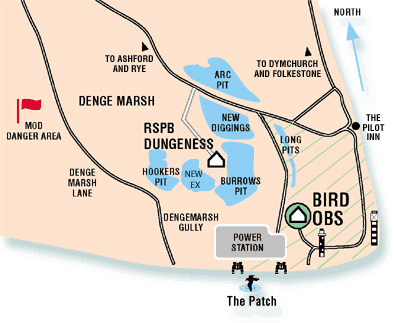 Dungeness Bird Observatory is a registered charity and is operated by an independent Board of Trustees. There is a resident warden and an assistant warden, usually between March and November.The Observatory’s recording area is the south-eastern corner of the Dungeness shingle promontory which juts out into the English Channel at the western limits of the Straits of Dover. Historically, bird migration studies formed the focus of the work of the observatory but in recent years interests have extended to include Lepidoptera, Odonata and Orthoptera along with on going recording of the flora of the area. Birdwatching at Dungeness can be excellent at any time and the Observatory remains open for most of the year. Dungeness is an important migration point, acting as a staging post for both British and Continental landbird migrants, and its position also makes it well situated for the observation of seabird passage.There are two hides on the beach at Dungeness for the use of Friends and guests. The Seawatch hide is used mainly for observing up and down Channel movement of seabirds whilst the Patch hide is sited to overlook the warm-water outfalls (the Patch) of the Dungeness Power Station. Keys are held at the Observatory. The Observatory makes an ideal centre, too, for exploring the varied habitats of the Dungeness promontory. The various lakes in the area (at the RSPB Reserve, Scotney, Lydd and Lade) support an interesting variety of breeding birds, including Bittern and Marsh Harrier, whilst in winter large numbers of wildfowl are attracted to the area.